Holocaust Memorial Day took place on the 27th January 2019. The focus of the day, which is commemorated annually, is to remember the atrocities of the Second World War and to ensure that mankind doesn’t repeat the horrific deeds of its past. The date marks the day in 1945 when the Russian army reached the concentration camp Auschwitz in Nazi-occupied Poland. It is a day to remember those murdered in the Holocaust and also in subsequent genocides in Cambodia, Rwanda, Bosnia and Darfur. HMD 2019 marked the 40th anniversary of the end of the genocide in Cambodia (1979) and the 25th anniversary of the Genocide in Rwanda, which began in April 1994. A group of students from St Charles marked the day by preparing and mounting a stimulating and informative display in the College atrium, which centred on this year’s theme Torn from Home. The theme encouraged us all to reflect on how the loss of a safe place called “home” is part of the trauma faced by anyone experiencing persecution and genocide. The display helped students and staff reflect on what happens when individuals, families and communities are driven out and wrenched from their home and also upon the difficulties survivors face in rebuilding their lives and homes. 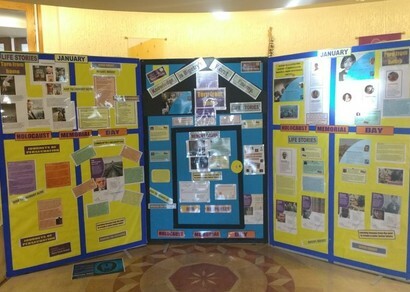 The display had a big impact on the student population’s knowledge and understanding, as well as increasing their desire to take part in positive social action. Students took part in a postcard project to explore the theme. They explored the life stories of survivors who were forced to flee their homes and wrote messages of empathy and understanding to them, which were then posted up for people to read. Students and staff were also able to watch a short, but truly engaging, video clip produced by Raafay (Khalid) and Robert (Norat), two A level students from St Charles who visited Auschwitz last March as part of the Lessons from Auschwitz programme. This year four more St Charles’ students were privileged to be part of the same programme and you will shortly be able to read all about their reflections on the experience also.